Many books will give you a “dictionary definition” of each state’s name. And state history books might tell you a little more about each name’s derivation. 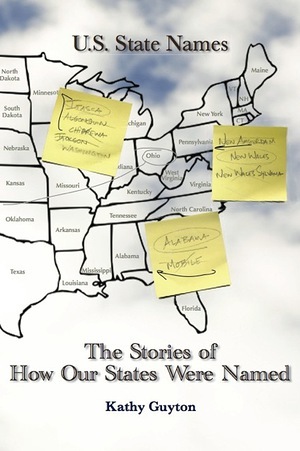 But until now there has never been a book that gives the entire story for every state name. U.S. State Names takes each state's name, and tells us its derivation as a trip through that state’s history, leading wherever the name takes us. Guyton describes what the name means, what language it comes from, why it was used, and what other names were considered. She delves into what kind of Congressional debate may have occurred and discusses what images and ideas that name conveyed to the founders, and what it means to us today. Guyton even writes about new theories regarding the origin of certain names like Maine, Arizona and Oregon. Guyton's book is generously illustrated with more than 200 pictures and maps. It is impeccably researched, taking information from history books, the Congressional Record, old and new atlases, as well as newly available on-line sources such as genealogy databases and journal archives.